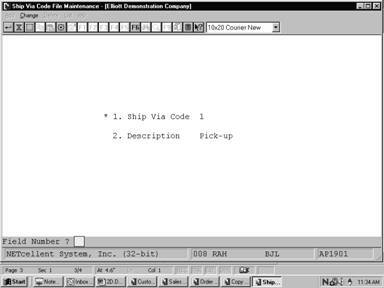 The Ship Via Code File represents the method of shipment normally used by the vendor. It is used in the Purchase Order and Receiving package when purchase orders are being entered. 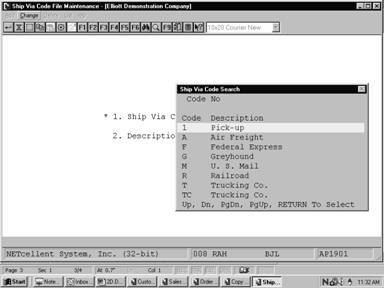 Whenever the Ship Via code is entered at a terminal, it will be looked up in this file and the description will be displayed. Choose a two‑character code for the shipping method being entered. For example, freight train might be represented as FT. All vendors who normally ship merchandise via freight train would be given this code. In change or delete mode, press the F7 key to search for Ship Via Code. 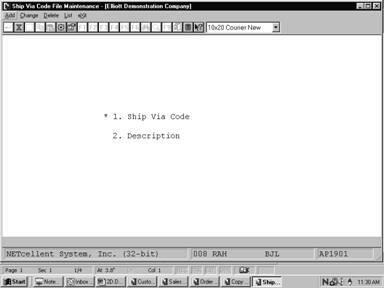 Enter a description of the Ship Via code, which will make it clear to the operator at a glance whether or not he has entered the correct code.